In Body Weight Exercises, Inspirational, Pull-ups! 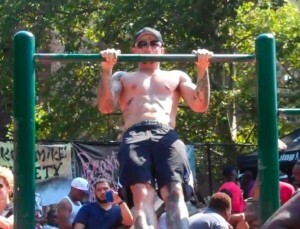 This past Saturday I took the #4 train into Brooklyn for the annual 5B’s Pull-up Jam at Lincoln Terrace Park. Unlike last year’s contest, however, I didn’t enter the actual competition. This time I just went to hang out, be a part of the good vibes and of course, get my reps in. While the contest was happening in one part of the park, a crowd gathered near another set of bars for an informal freestyle exhibition. A lot of big names from the extreme calisthenics community were on hand to represent. There was no shortage of pull-ups, muscle-ups, levers and many other advanced moves. All in all, everyone had a good time and a great workout. Thanks to all who entered and attended, and especially to everyone behind the scenes who made this event so much fun! Looks like a hot bed of strength, skill, talent, etc. with bodyweight exercises in your area. Truly inspiring. I look forward to obtaining some of these moves in the next year or two. Some I’m at now but a year ago I wasn’t. Do they have a website for this competition? I like to see it in person sometime. Thanks, Trevor. There is a 5B’s Pull-up Jam facebook page but I’m not sure if there is an official website. I think the contest is typically on a Saturday in August every year. The more ppl are into this game, the better it becomes!